If you suffer from high blood pressure, then you’ll definitely want to check out this simple dietary solution. Often referred to as a silent killer, high blood pressure can often take a toll on our bodies, without us even realizing it. What if I told you that you could avoid these dangerous consequences altogether by making some simple changes to your diet? We all know that a high-sodium diet can increase your risk for high blood pressure, which can lead to a heart attack or stroke. But a recent study has revealed that a diet rich in potassium can counteract these effects. Replacing some foods in your diet with high-potassium alternatives can help control your sodium retention. Salt is a key ingredient in many foods that we love to indulge in, and no one wants to sacrifice taste. This new finding tells us that we don’t have to; increasing the potassium in our diets will allow us to enjoy the foods we want to, without putting ourselves at an increased risk for blood pressure problems. Researchers have found that if you consume a diet high in sodium and low in potassium, your body will retain the sodium to hold onto its limited supply of potassium. As a result, the sodium in your diet increases, which could be even more detrimental to your health. The typical Western diet contains increased amounts of sodium, but how did our collective eating habits end up like this? Our early ancestors consumed a primitive diet that mainly consisted of roots, fruits, beans, and grains. Since they had a high-potassium diet, we’ve evolved to crave sodium, not the other way around. Because our diet is now imbalanced in this regard, we have to make a conscious effort to consume foods that can help us reach our daily potassium intake. Eating just 4.7 grams of potassium a day could help lower your blood pressure, and even reduce the risk of kidney stones and bone loss. Having three-quarters of a cup of black beans can account for nearly half of the recommended daily consumption. 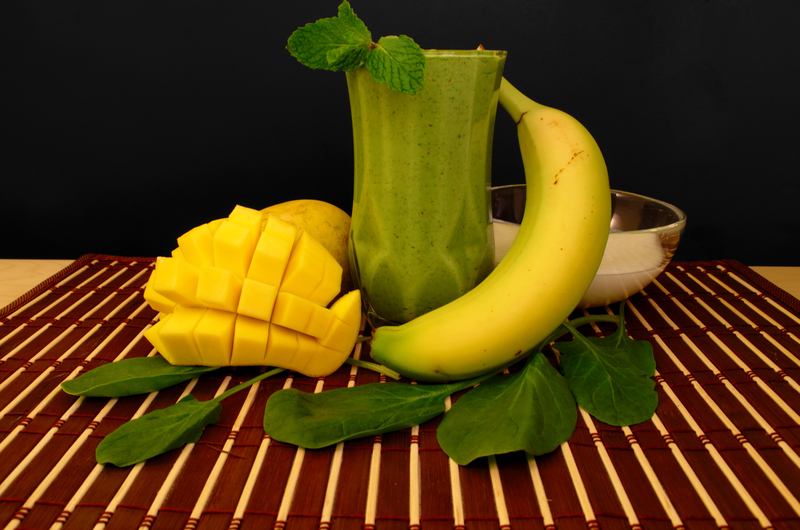 Whenever I have a smoothie, I make sure to include dark leafy greens like kale and spinach, and fruits like banana, papaya, and mango—and a little honey for added sweetness! These high-potassium foods make reaching my daily potassium goals that much easier, and allow me to enjoy a delicious snack. Other high-potassium foods include sweet potato (baked), clams, milk, lentils, artichokes, prunes, and fish such as haddock or salmon. Limiting the sodium in your diet can help control your blood pressure, but remember, adding potassium can help even more. Making simple dietary adjustments can work to counteract the consequences of hypertension, including strokes and heart disease. “Fruits and vegetables’ latest superpower? Lowering blood pressure,” Science Daily, April 5, 2017; https://www.sciencedaily.com/releases/2017/04/170405130950.htm, last accessed April 12, 2017. McDonough, A., et al., “Cardiovascular benefits associated with higher dietary K+ vs. lower dietary Na+: evidence from population and mechanistic studies,” American Journal of Physiology, Endocrinology and Metabolism, April 1, 2017; 312(4): E348-E356. doi: 10.1152/ajpendo.00453.2016.